We offer various programs so our clients can choose one that fits their individual needs. Our professional treatment techniques utilize the most up to date products yielding efficient results in controlling insects. One Time Service - We offer a one time service that is guaranteed for 2 months. 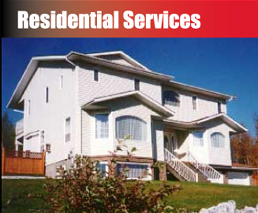 We will stop by your home and provide our professional and effective service. Bi-monthly Service - One of the most popular programs we offer is our bi-monthly service program. After the initial treatment, we will return and service the outside of your home once every other month to effectively control the insect population around your home. Monthly Service - We also offer a monthly service program for those who require that extra measure of attention and service. For those individuals who wish to see us only once a year or semi annually, just give us a call and we will be happy to provide you the prompt and effective service you deserve. NOTE: It is not necessary to treat inside of your home each time as the materials are not subjected to the same environmental factors present outside. Most of the pests that we encounter inside come from the outside and are easily controlled with regular outside treatments. Our Guarantee - If you have any problems between our regularly scheduled service visits, just let us know and we will stop by and take care of your problem for you at no charge.